Those green blobs in my May 22 painting ("Our Garden", ) have bloomed, becoming red, and pink, blobs. The color and especially the intensity of the red was a challenge to equate in paint. Just beginning their ascent of the fence are morning glories. Eventually the fence will disappear under a blanket of green vines, and blue, purple and red flowers. 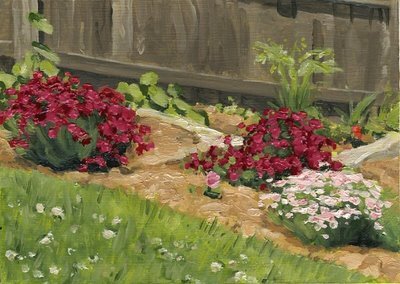 I would love to be out in the garden all day, every day, painting. There's so much going on, it changes every day, and everything seem to be accelerating. Except me.